Medium ruby garnet color. Toasty aromas and flavors of chocolate fondue with strawberries, chocolate cream of wheat, nut brittle and tootsie rolls, and grape and tomato leaves with a supple, bright, dry-yet-fruity light-to-medium body and a polished, delightful, medium-length smore’s, nutskin, and minerals finish. A pleasant, very chocolatey red blend sipper. Bottom Line: A pleasant, very chocolatey red blend sipper. 97 • Amalthea 2015 Legend’s Edition Europa I, Outer Coastal Plain 12% (USA) $29.99. 95 • Amalthea 2015 Legend’s Edition Europa IV, Outer Coastal Plain 12% (USA) $27.99. 94 • Amalthea 2014 Legend’s Edition Europa III, Outer Coastal Plain 12% (USA) $29.99. 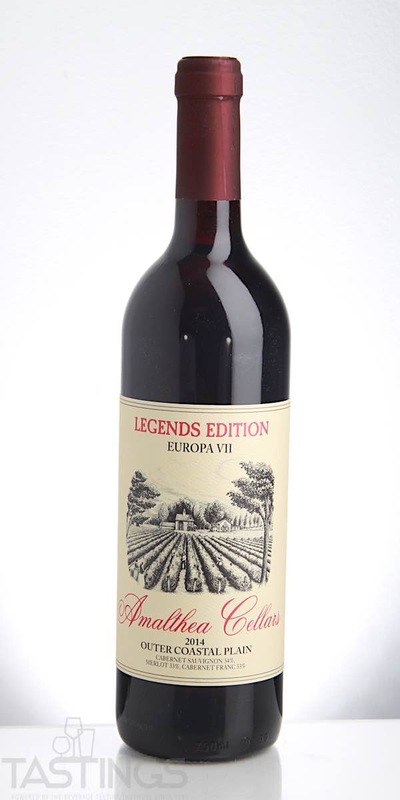 89 • Amalthea 2014 Legend’s Edition Europa VII, Outer Coastal Plain 12% (USA) $32.99. 92 • Amalthea 2015 Clone II, Cabernet Sauvignon, Outer Coastal Plain 12.5% (USA) $24.99. 94 • Amalthea 2015 Reserve, Cabernet Franc, Outer Coastal Plain 12.5% (USA) $24.99. 91 • Amalthea 2015 Reserve, Merlot, Outer Coastal Plain 12.5% (USA) $24.99. 95 • Amalthea NV Carmé Red Blend, Outer Coastal Plain 12.5% (USA) $27.99. 88 • Amalthea NV Leda, Outer Coastal Plain 12.5% (USA) $16.99. 87 • Amalthea 2013 Sur Lie, Chardonnay, Outer Coastal Plain 12.5% (USA) $18.99. The greatness of red wines from France's Bordeaux region can be largely attributed to the art of blending. There are five red varieties that can be used in a Bordeaux red: Cabernet Sauvignon, Merlot, Cabernet Franc, Petit Verdot and Malbec (this last is rarely seen anymore in Bordeaux). The reason for blending several grapes to craft the final wine is for greater complexity as well as elegance. Each grape has various characteristics and can attribute special qualities to the final wine. Cabernet Sauvignon is powerful and tannins, while Merlot has lighter tannins, while Cabernet Franc has a spicy, peppery quality to it. Blending these grapes together will round out all of these qualities; sort of a "the whole is greater than the sum of the parts" rationale. This principal of blending is used in many regions besides Bordeaux, especially in California, were the blends are often given proprietary names, like Opus One, Insignia, and Quintessa. 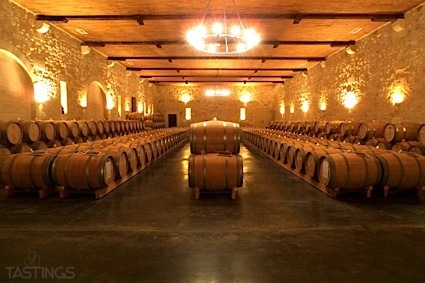 US blends of Bordeaux varietals may also be labeled, in addition to their proprietary name, by the designation of Meritage if they are approved and licensed by the Meritage Alliance. Blending in Bordeaux is common not only on the prestigious wines from historic estates that cost hundreds of dollars per bottle, but also on the lighter-styled wines that are priced in the mid-teens. Aging potential can often be directly linked to the price of the wine, from three to five years to three to five decades. Pair these wines with most red meats, games or roasts. Amalthea 2014 Legend’s Edition Europa VII, Outer Coastal Plain rating was calculated by tastings.com to be 89 points out of 100 on 6/14/2018. Please note that MSRP may have changed since the date of our review.